That really is one of the motivations for using great skincare, is it not? The dedication to our morning/evening skincare routines does more than just focus on washing our face to clean up the dirt and grime for a cleaner and clearer reflection. We use anti-aging creams and serums in the hopes of preventing/treating/prolonging aging, along with other products to treat certain conditions that we hope short-term or long-term will be able to be helped. I know for me, I have a loooot of products in my vanity to help with my post inflammatory hyperpigmentation (especially on my right jaw/neck area). I know it's not going to be gone overnight but I diligently use these products in the hopes that with consistent usage that they will eventually go away. It's all for a future solution. 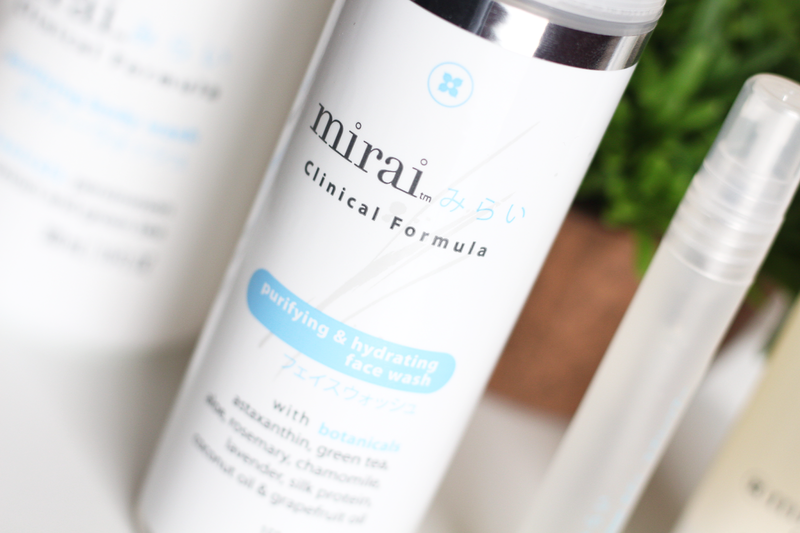 Mirai Clinical is a brand that caters for that future solution we all want and diligently work hard for. Mirai is an indie Japanese natural skincare company created by Koko Hayashi, Hokkaido-born author and Mirai Clinical youtube content creator. It is founded on the Japanese skincare psychology of 'Less is More.' Per this psychology, it's taught that using less and more effective products allows for healthier, softer, smoother, and brighter skin, along with seeing longer lasting results. Here's a simple explanation of Mirai's belief of it. Mirai uses specific guidelines for sourcing and processing all of their natural-based ingredients, including not using any harmful synthetics, fragrances, and food extracts that contain psoralen (a photoactive molecule found in certain foods such as citric fruits, and if consumed it crosslinks double-helix DNA strands together with skin's exposure to UV radiation and stops cell activity; it is also well-known as being used in phototherapy for psoriasis). Mirai is also cruelty-free, which is something that's so very important. They are annually featured in the Emmy Award's ceremonial gift bags and are often featured in online publications. 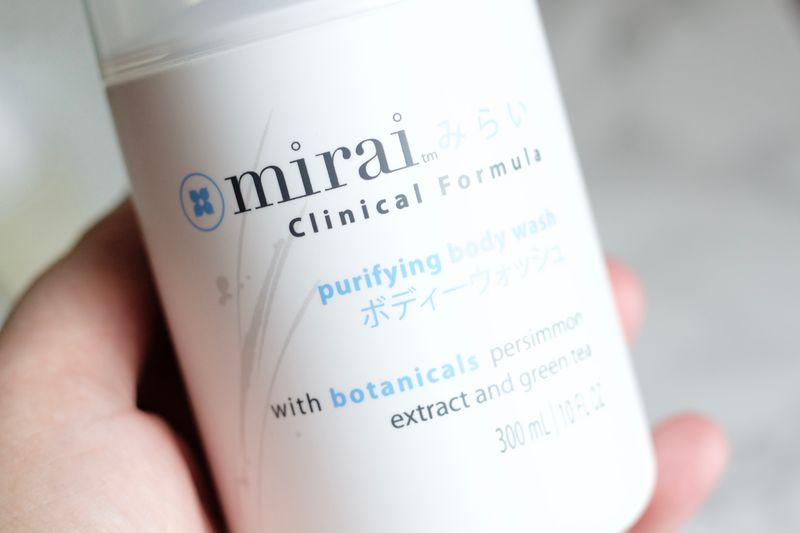 What makes Mirai Clinical so special is because of its inclusion of effective natural ingredients. Persimmon and Astaxanthin are two unique ingredients included in numerous products. Some of my favorites also found in the range are Green Tea, Aloe Vera, Rose Geranium, and so many others. Astaxanthin is a powerful antioxidant found in microlagae and fish such as salmon, noticeable as a naturally occurring red pigment, and has been case studied as being a very good anti-aging ingredient. It's also been shown to provide fragile cell membranes the protection they need by neutralizing free radicals or other oxidative attack. Its golden moment relies on its significant antioxidant abilities in humans, such as helping and normalizing oxidative stress and protecting against oxidative DNA damage. Being a carotenoid (plant pigments) and vitamin A derivative, it's a very vital ingredient for anti-aging and especially for its photoprotective abilities, in addition to treating and preventing various diseases. Overall it's a very superb ingredient to use, especially in skincare. Mirai sources their Astaxanthin from freshwater algae and it does not contain shellfish or allergens. Persimmon goes well with the usage of Astaxanthin, since it's another powerful natural antioxidant. Persimmon is a fruit that has naturally purifying and anti-aging benefits, along substantial cardiovascular and oxidative stress reducing effects. Mirai's Persimmon extract is harvested each Fall, and is processed and tested at their facilities in Japan. This extract, known as tannin, is a polyphenol-rich natural astringent plant compound found in the pulp of a Persimmon, along with being in other numerous food like cranberries, grapes (for wine too! ), etc. Persimmon tannin specifically works to bind and precipitate proteins, separating them from contaminants. It should also be noted that Mirai's Persimmon tannin goes through a fermentation process, by using the Lactic acid gram-positive bacteria called Lactobacillus. Persimmon does well to get rid of Nonenal (odor) through the usage of its juice and tanin. Nonenal increases with aging. Due to change of skin chemistry, specifically oxidative, Nonenal odor is not something that's just as easy as getting rid of by taking a shower. Since it's being active due to the body's own response to a certain development (in this case being the skin's reaction to aging, by enacting nonenal 'odor' compounds), it's an ongoing situation. The sebaceous gland is what controls the skin's lubrication (that's right, good 'ol sebum), along with kerotinocyte cells found in the epidermis, being involved in skin conditions such as acne, etc. Both fatty acids and free fatty acids are sourced from both sebaceous and kerotinocyte origins, which is important as a whole since they are a form of lipids, which are not water-soluble (aka not so easily washed away). But the interesting part is that there are numerous scientific studies done to back the connection of skin's changing chemistry to aging and this odor found in some aging individuals. Of course, there is no generalizing here and everybody is their own individualized person. Everybody is a unique case (taking in personal hygienic habits, environment, diet, etc), and these ongoing studies are substantial to finding out the questions/answers relating to this odor plagued in certain individuals. Koko-san had kindly sent me these products to try for review and I've really enjoyed them all! This Purifying & Deodorizing Body Wash* is very soft and sensitive to use on the skin. Aloe Vera is one of the top botanical ingredients, along with Persimmon, Rose Mary, Rose Geranium, and Chamomile, which mix all together to provide hydration and a light wash. This works well to battle in eliminating Nonenal odor on the surface of the skin (it is not absorbed into the skin, that's not how it works), as well as any other strong emitting odor, and has a fruity/citrus aroma. It works wonders to moisturize and help any irritation. I can attribute that to the Green Tea, Aloe Vera, and other anti-inflammatory botanicals found in the ingredient list. 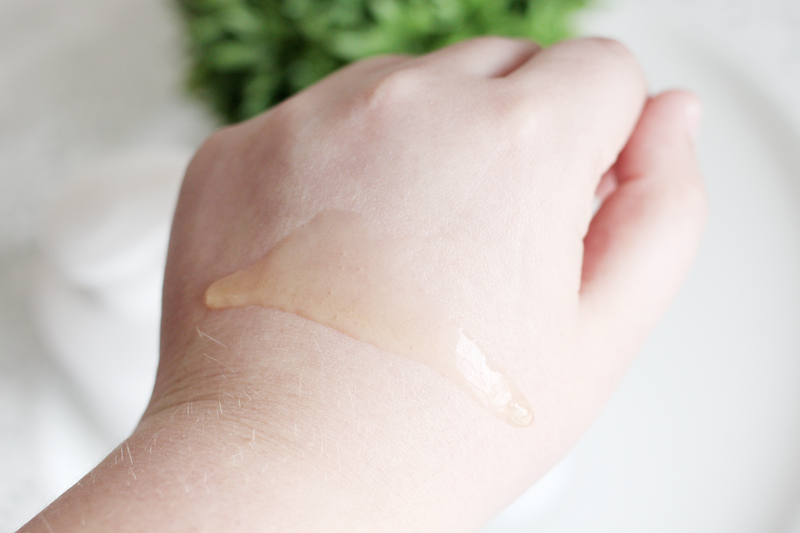 It comes out as a gel-like texture that is easily spread all over the skin, adding a cooling feeling. You can use this not only as a body wash, but also as shampoo too. This is an amazing product that I think a lot of people will enjoy, as its aroma is not too strong (so those with fragrance sensitivity might do well with it), and it works very well to really make you feel all clean and refreshed. It's main two surfactant ingredients are derived from coconut oil: Cocamidopropyl Hydroxysultaine (naturally derived synthetic) and Sodium Cocoamphoacetate (mild amphoteric organic compound). These do well to help the thin gel consistency of the product smooth out over the skin and create a very mild, gentle experience. The following coconut oil derived Cocamide Mipa, works well as a foaming agent and complimentary to the first two ingredients. Polyquaternium-71 is a plant-based humectant and Sodium Cocoyl Oat Amino Acid is a skin conditioning ingredient (providing a smoothness to skin). Sodium Lauryl Glucose is a sugar-based surfactant and is used as an emulsifier, made by a mixture of fatty alcohol from coconut oil and glucose from corn. The whole basis in the first chunk of this product is to create a very light, moisturizing product that is smooth and gentle to use. Following these are a bunch of botanicals, like the vital fermented Persimmon juice extract and so on. Definitely a treat. It is free of harmful chemicals, sulfates, synthetic detergents, foaming agents, preservatives, and coloring. Purifying Body Spritzer* is alike to the body wash in that it not only has some of the same ingredients, but claims to work to also eliminate Nonenal odor. Green Tea and Persimmon are familiar names to see, but now Astaxanthin has been added to the equation. Astaxanthin is a powerful antioxidant that works to extend the effectiveness that Persimmon extract does by neutralizing and masking the unwanted odors. I will be upfront about the smell: it is quite strong and smells like alcohol mixed with some faint grapefruit. I know, that sounds interesting to describe. Seeing as the denat. alcohol is the second ingredient after water (not a negative per say, as denat. alcohol in my books is not bad in conjunction with other ingredients), I'm not surprised it's so strong. I do wish that some of the botanicals would add to the aroma, however! Although, that's not the purpose of this product so I can't really think too negatively in that matter. 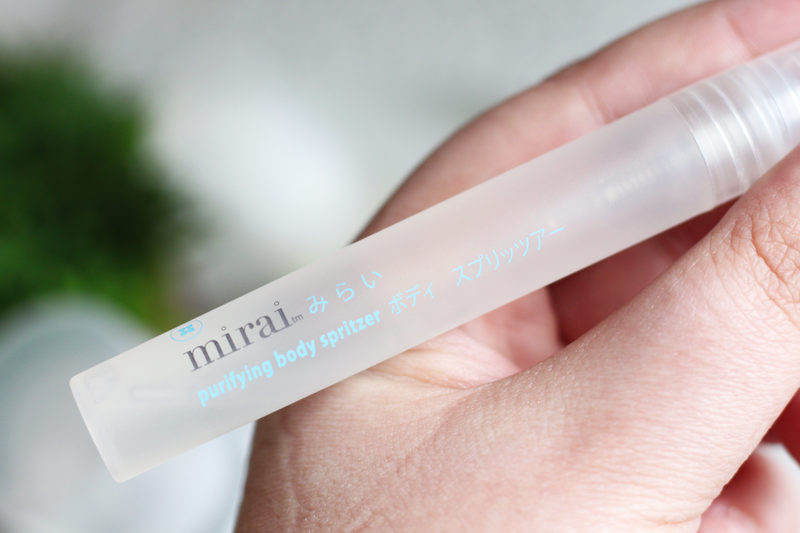 The great thing about this product from Mirai is that the smell goes away within seconds after spraying it, working to neutralizing and mask whatever needed. I honestly try and go to smell the same areas and I can't smell anything! It really does work for masking odors and I think especially for those who smoke/living with a smoker, this might work wonders for you. I'm no stranger to carrying around fragrances, I always have either a rollerball with me or some mini spray. I just love the feeling of using a perfume/mist when I'm feeling a bit like the day's gone on too long or I need a refresher. Japan sells a lot of different kinds of body mists/perfumes, depending on their function (ex., how much do you want to get rid of that pungent smell from someone across from you eating their food on the train?). If you want some perfume for your hair, Shiseido has your back. Hair perfume is probably my favorite thing ever and such a smart thing too. There are lots of different brands that create specific products to combat odor and many are small enough to just throw into your bag. Japan definitely has their priorities straight with this one. 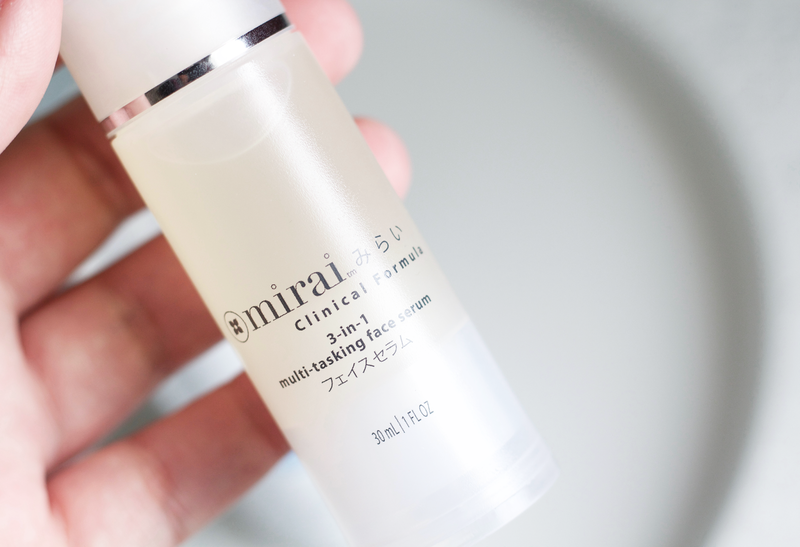 3-in-1 Multi-Tasking Face Serum* is my second favorite product out of all. This product is a multi-tasking toner, moisturizer, and age-defying serum all together in one. It is a very light weight formula that can be used both day and night, with only a little bit needed for an application. This was a great serum to use in the morning, which was how I primarily used it. I loved that it is touted as this three-based system, as it really is so moisturizing to use. In the packaging it looks a bit yellow-ish, but when its pumped out (at least on my skin) it looks more translucent. The smell is quite interesting, I wish I knew how to explain exactly what it is? Aloe Vera is the second ingredient, which I am happy about and am thinking it must be a big part of its aroma. It's a somewhat calming smell, a bit medicinal, but nothing very strong. It doesn't at all smell very herbal-y or give me any indication that all of these botanicals are included in this product (again, I would looove to really just smell the lovely aromas of all the botanicals included---Rose Geranium is just too gorgeous of a smell to mask!). This serum dries to a velvet finish and leaves the skin quite hydrated and cool. I definitely could tell that it helped settle down some inflammation and irritation I had on my left cheek after using some new acid products (ouch). I didn't see any substantial brightening effects (or fading) to any big spots or any big difference to my acne, per say. Since this is targeted as an anti-aging and moisturizing product, and I'm mostly doing preventative care with some minor treatment spots, I really have been happy with what I've seen since it's helped some stressed fine lines on my forehead and overall smooth out my skin. I'm so impressed with this product because of all of the ingredients involved really work so well together to provide an effective outcome. Looking at the ingredients now, there are a good amount of moisturizing and humectant properties in the first names. Aloe Vera, of course, not only a great anti-inflammatory and anti-irritant ingredient but also providing a non-greasy feel to the skin as a moisturizer. Panthenol is derived from pantothenic acid/Vitamin B5 and is used as a humectant, helping to retain moisture deep in the skin's tissue. Methyl Gluceth-10 is a water soluble humectant/emollient and helps to smooth skin. Sodium Hyaluronate undoubtedly a great source to include with all the humectants before it, and Pentylene Glycol, a synthetic humectant, following it. Some of my favorite botanicals are included in this, such as Tamarind Seed Extract (helps to improve skin elasticity, hydration), Lavender oil (anti-inflammatory, antibacterial, soothing), Green Tea (anti-inflammatory, antioxidant), Rose Geranium oil (helpful for oily skin, anti-inflammation, helps acne-prone skin), Rice (natural skin lightener), Rosemary (natural preservative, great for oily skin), Sandalwood oil (great for oily skin and very calming), etc. Others I am not so commonly familiar to using in skincare, such as Shiitake Mushroom extract (Lentinus Edodes, a plant polysaccharide, that is known to treat numerous diseases such as cancer, and is a known antibiotic and anti-carcinogenic), Reishi Mushroom extract (Ganoderma Lucidum, a fungal species, has been known to be used to treat cancer and demonstrate substantial anti-cancer activity), and Hydrolyzed Soy Protein (Sericin, protein created by silkworms in the production of silk) which has been studied as great for cell adhesiveness for tissues and regenerative medicine. Sericin works to help keep the skin supple and provide great moisturizing benefits. The mushrooms work as great antioxidants, along with helping to brighten and provide anti-inflammatory benefits. Some powerful botanical anti-aging properties are working together in this product, and it was really interesting to research all about these. Purifying & Hydrating Face Wash* is my favorite out of all of the products I was kindly sent. It is a very light, gel-based foaming cleanser that is great for getting rid of skin impurities and oil. It claims to "gently cleanse, moisturize and soften with the most skin-friendly ingredients from nature," and supposed to "hydrate, prevent dryness, and keep skin supple." I didn't really use this to get rid of my makeup, only used it on days when I wore sunscreen or no makeup at all and had it as a first cleanse mostly (or if I did only one cleanse, then of course just as my main cleanser). I did accompany it with my clarisonic and it worked very well that way, too. I looove how light it feels and the fruity grape scent. This product out of all of them keeps the smell and it's not at all strong. It feels very refreshing as you work it into the skin, I really like how it gets rid of my oils and grime that accumulate so much for me with having my skin type. It pumps out just enough that you need for one application and I appreciate that it's so precise with that. Some products I feel like they give too much leeway with their pump mechanism, I end up wasting so much product in the end! I also like that there is a little cap to cover the opening. I don't know if that's supposed to kept on but I've kept it on ever since I got it, and replace it on after I use the product. Coconut oil derivatives are again the main base here and are the first chunks by being surfactants and emulsifiers. Aloe Vera Leaf Juice works as to soften and hydrate dry skin due to its humectant properties and binding moisture to skin, helping with its anti-inflammatory benefits. Hydrolyzed Silk makes its appearance again here, along with Astaxanthin and other anti-aging beneficial ingredients that work in multipurpose with moisturizing properties. Rosemary, Rose Geranium, Lavender, Grapefruit, Green Tea, Chamomile, etc, all great botanical ingredients: anti-inflammatory, antioxidant beneficial activity, moisture, detoxifying properties, stress reducing, calming, and refreshing skin. I can 100%+ say it did this and has made washing my face early in the morning really a nice activity, especially getting up for University. 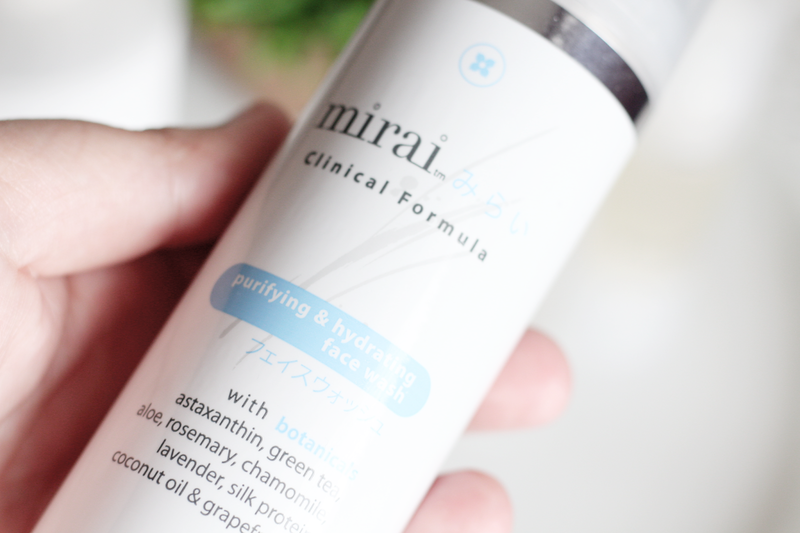 I think that if you had to choose amongst all of the products to try, this, the serum, and the body wash might be your best bet to really getting the sense of what Mirai Clinical is all about and what their products are. This is a reaaaaally interesting product! 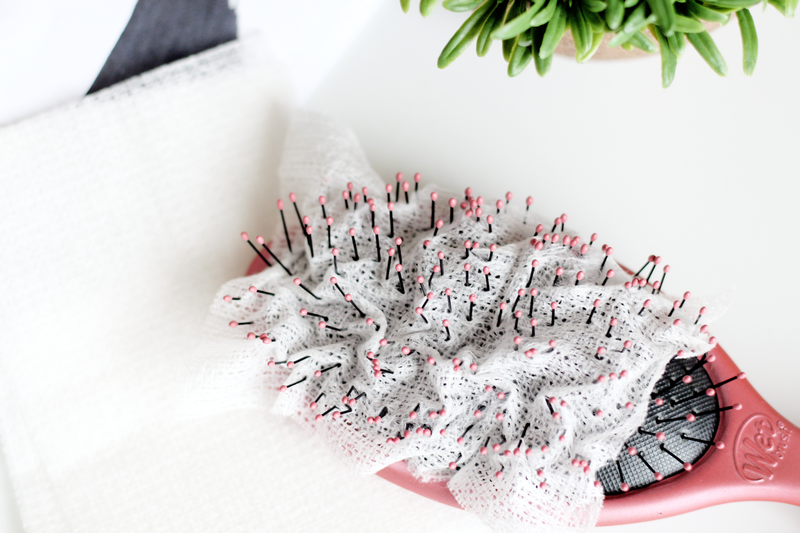 Mirai's Deodorizing Hair Brush Liner* made with Japanese Persimmon absorbs dirt and odors with its natural cotton fibers imported from Japan, keeping your hair fresh and brush clean. With using natural fermented Persimmon extract, it neutralizes the odors and becomes a "dry shampoo" that absorbs dirt, sprays, and gels. So who exactly is this brush aimed for? I think those who are prone to dandruff or naturally have quite oily/greasy hair (like me!). It works wonders to really refresh the smell and also texture of your hair. One day I was running out the door and noticed how oily my hair looked (it may be Fall already but Southern California does not bend to the rules of seasons! ), so I quickly brushed it with my brush with the liner tucked into the insides of it (not how it's lazily flattened out here, it's supposed to be tucked in) and it dramatically helped it after a few run-throughs. I don't own any dry shampoos as I've been averse to using them after a weird accident with one (I don't know if I was just using it wrong or what, but it made the top of my head look really crusty?). I think it also depends on the kind of dry shampoo that you use, as there are powder or aerosol based ones. I think you definitely have to be careful what you use on your scalp, as it is skin that needs to be taken care of (I think sometimes people forget this fact) and the chemicals in your shampoo/conditioner/dry shampoo can actively hurt it. This list of common dry shampoo ingredients was interesting (of course just a base), along with looking at numerous brands' products. I found a mixture of harmful chemicals included in soooo many, especially popular ones like Batiste. 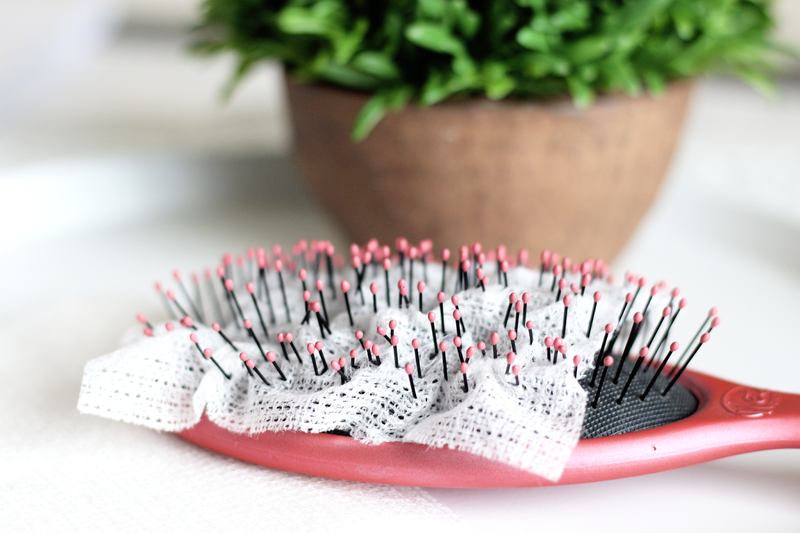 Using Mirai's Deodorizing Hair Brush Liner does not take the place of washing your hair, it is in supplement to it. 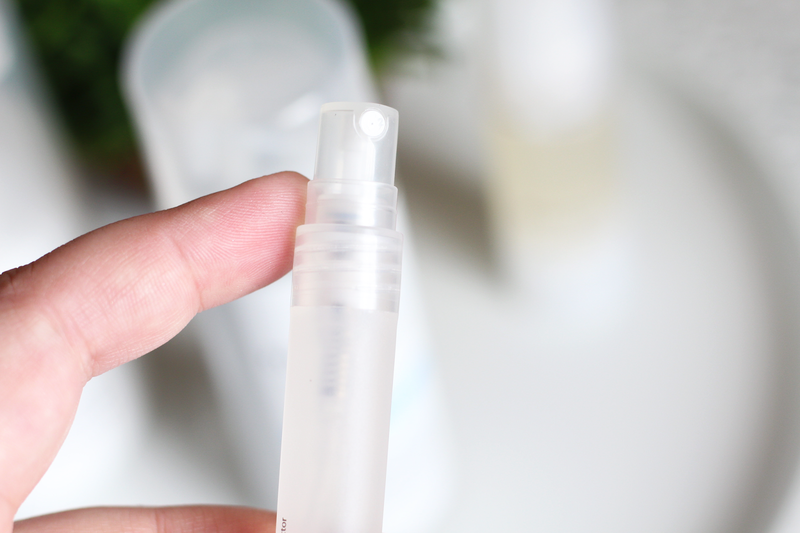 It's a really interesting product and I think if you're wanting for a more green dry shampoo replacement, this might be a non-aerosol good alternative. I have to thank Koko-san for kindly reaching out to me and sending me these products to try and review. She's such a sweet person and kind soul. I love the Mirai instagram, they always upload such positive and energetic things! I really hope you'll check out some of their products and help spread word about them. Do you own any Japanese skincare products? What are your favorite brands? 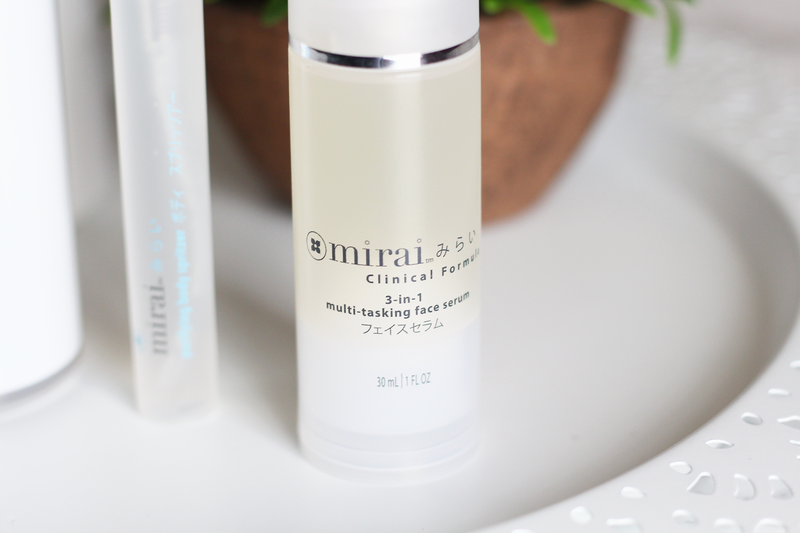 *This product has been kindly PR gifted from Mirai Clinical. See my disclaimer for more information.